Together as 2/50 Greatest Players of All Time. Together as street signs outside EnergySolutions Arena. In one day, together in the Naismith Hall of Fame. There have been a number of great duos/one-two punches in NBA history. However, most if not all of these were one great player + one great sidekick. “Pippen to Jordan” was not a saying. Not so with Stockton-to-Malone. As Hot Rod said, you say “Stockton-to-Malone” like it’s one word. Stockton and Malone were equals. Stockton and Malone were equally great. Stockton and Malone made each other great. I am aware of how sappy I sound, but I can’t help it. Know why? Because it was clearly divine intervention–fate–that brought Stockton and Malone together. What if one of them had been drafted by another team? What if one of them had had only an average work ethic? What if only one of them had loved to punish gym equipment? What if one of them had been injury prone? What if one of them had a normal tolerance for pain? What if one of them had desired bright lights, fame, and endorsements? What if one of them had been born 5 or 10 years after the other? What if one of them had been 6″ shorter or the other had been 6″ taller? What if one of them had been born with a normal-sized pair of hands, and couldn’t throw or catch those ridiculous passes? What if Utah hadn’t been coached by Jerry Sloan, whose system was perfection for a point guard-power forward combination? What if Larry H. Miller hadn’t been able to keep the team in Utah? There are so many more what-ifs I could pose, and any of them could have easily been. Instead, an incredible, amazing, turn of fate* brought these two men–born one year apart, the perfect size combination under the perfect coach, with transcendent work ethics and intolerance for pain, drafted by and happy to live in Utah–together. Stockton and Malone easily could have ended up on different teams, or only played five seasons together, or been a point guard/shooting guard or small forward/power forward combo. Instead, they ended up as a PG/PF combo that played 1,412 games–more than any other pair in NBA history–together. You can’t convince me it wasn’t divine intervention. If that’s not worth violins and sappiness, what is? There will never be another John Stockton. There will never be another Karl Malone. 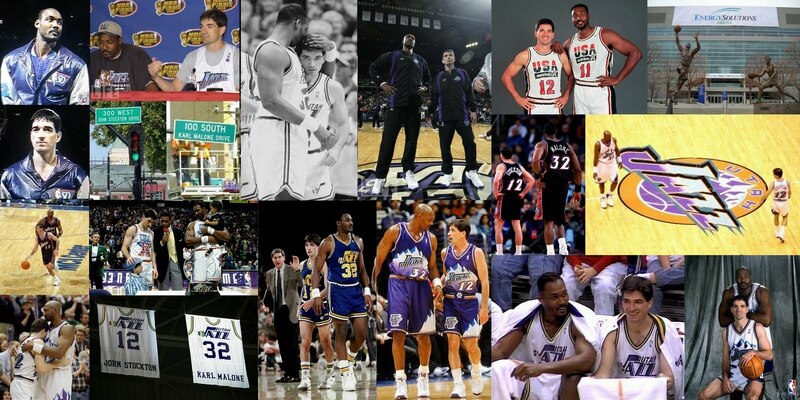 Most of all, there will never be another Stockton-to-Malone. They were so lucky to have each other for two decades. We were so lucky to have them for two decades. I would’ve loved for them to have won (a) championship(s), because it’s something they wanted and fought for. Me? I honestly wouldn’t trade the complete and absolute privilege of watching Stockton-to-Malone play for my team for 11 years*** for all the championships in the world. I mean that with all my heart. **Louisiana Tech and Gonzaga’s men’s basketball teams are both called the Bulldogs. Another aside: my alma mater’s mascot is also a bulldog. Clearly, I was meant to be somewhere in this equation too.